The Triumph Herald was styled by Italian designer Giovanni Michelotti and was available as a saloon, coupe, convertible, estate and van. The Herald was built to replace the Standard 8 and Standard 10 models and compete with the successful Moris Minor, Ford Popular and Austin A35s. Due to the Heralds individually removable body panels, variants were easily created and the coupe and saloon models were closely followed by the convertible, estate and van versions. With its clean interior and modern lines the Herald received a warm welcome from the press and dealers. 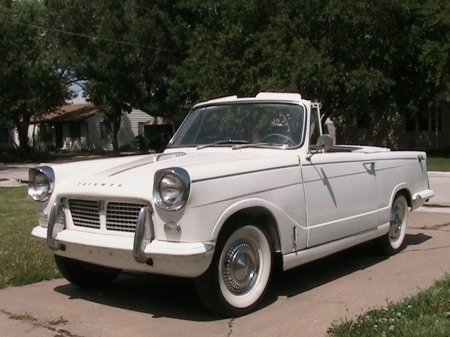 The Herald was a success for Triumph and sold over 400,000 units. Its contributions to Triumph continued long after production ceased, as it was the base for many cars in the Triumph line up including the Triumph Vitesse, Triumph GT6 and Triumph Spitfire. At Classic Triumph Sports Cars our passion is to restore classic Triumph and provide a range of services for the Triumph owner. Take a look at our sales section for the current selection of used classic Triumph Spitfire sports cars available. Our passion is to see these amazing automobiles on our roads in the closest to factory condition possible and we have helped many owners achieve their dreams of having a truly amazing experience in one of these iconic British sports cars. Contact us for more information on the services we offer and current stock of cars for sale.